It’s beginning to look a lot like….arrgh! I’m on a bit of a rant. Don’t get me wrong I like Christmas but it’s only the beginning of November! 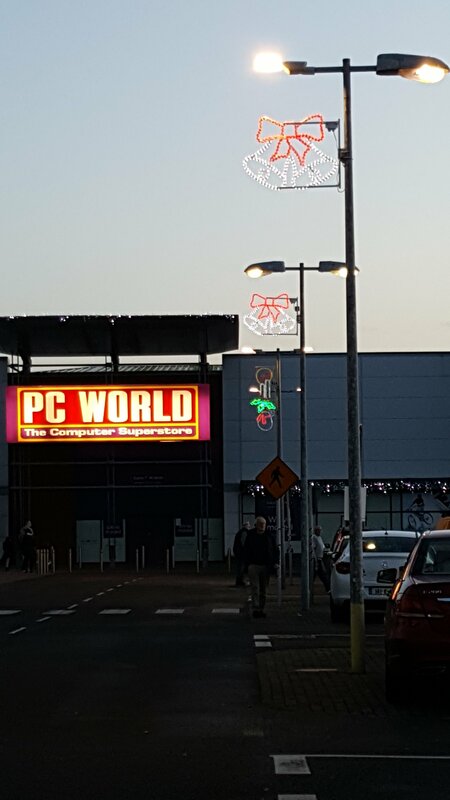 In Sligo some of the Christmas lights are on already. If that wasn’t bad enough Dunnes are playing Christmas songs. Am I alone in thinking it’s much too soon or am I being a Grinch? At this stage I’m going to be fed up of Christmas by the end of November and goodness knows how the shop assistants feel. Bah humbug or should I say Merry Christmas? Here in the USA it is the beginning of the Thankful Season. Our Thanksgiving Day is November 23. I am concentrating on being thankful for things. I am truly a Bah Humbug. I fully love Samhain just now, and we did this incredibly last night sharing food gifts and fuel and taking our gratitude into the lighted labyrinth. Next sharing will be old christmas, around Epiphany, wassailling our apple trees. Then re-open the herb labyribth garden with a Brighid Day brunch. All that other stuff I can never be bothered with. Dunnes will not see me again u til their January sales, maybe. I think just ignore it, and just hold what you believe in. If you believe in tinsel town and plastic santas, go for it … but don’t indulge in anything because you think you have to or someone may be hurt if you don’t … I do not think that is honest love and gratitude. With young children, I think the Santa thing is still quite lovely. Its often rite of passage gifting such as the first scooter, first bike, more grown up clothes, and similar. It’s too early for me. December 1st is early enough, or the week before if they must. Usually, in Canada, the real kick-off follows the Santa Claus parades in mid-November. But Christmas is certainly not all about the shopping and gift-giving!